This summer I took on the little hobby of bird watching. The reason I started this endeavor was so that I could learn to identify the birds that flew into my yard. Lewistown is a perfect place to see many of the species that roam the northern plains and Rocky Mountain regions. I also did a little traveling in the state and saw a few birds that might not make it to Central Montana. Essentially, it all started with a group of Cedar Waxwings that swooped in one morning and settled in for breakfast on my caragana bushes. Apparently, if you see one Cedar Waxwing you will see a dozen. I counted fourteen that morning. Other regulars to my yard were Robins, Northern Flickers, Mourning Doves, Starlings, Common Grackle, White-crowned Sparrow, Red-winged Blackbird, Song Sparrow, House Sparrow, and Chickadees. I saw several predatory birds closer to the Missouri River, including a pair of Bald Eagles, a Golden Eagle, a Red-tailed Hawk, an Osprey and a Merlin. I did get to see that tiny little flyer, the Broad-tailed Hummingbird near a cabin by Helena. They make a buzzing sound like a bee their wings beat so fast. 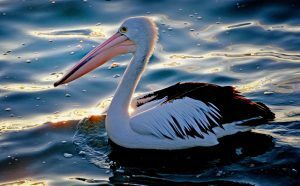 Once of my favorite birds to watch is the Pelican. They have such serious faces but also seem quite playful, they fly up the Missouri River so they can leisurely float down the river eyeing the fish below. According to the library book Birds: Myth, Lore and Legend by Rachel Warren Chadd, the Pelican is considered a protector of the afterlife and is thought to provide safe passage to the underworld. This was largely believed by the ancient Egyptians, and they also thought the bird scooped up evil elements in the Nile River. Pelicans have long had a relationship with humans and are seen on emblems and family crests as a powerful symbol of self-sacrifice and nobility. The Library hosts many books involving birds, whether in the literal or metaphorical sense. Reading Kyo Maclear’s memoir helped me in my birdwatching venture – Birds, Art, Life: A Year of Observation. Maclear lives in Toronto and goes through a year of urban birdwatching alongside a musician friend. The birds inspire her to start drawing again and her insights into their world touch the edges of her own. Jennifer Ackerman explores the intelligence of birds in her bestseller The Genius of Birds, and there are multiple field guides to get you started on Central Montana bird identification. Moving beyond the actual birds though, you can always read one of the many fiction books that emulate our winged friends. A brief list would be To Kill a Mockingbird by Harper Lee, The Thorn Birds by Colleen McCullough, The Magpie Murders by Anthony Horowitz, The Pelican Brief by John Grisham, and the ever popular Make Way for Ducklings by Robert McCloskey. One last thought on birds. A Chinese proverb says, “A bird does not sing because it has an answer. It sings because it has a song.” Let us all be as hopeful as the thing with feathers, and continue to appreciate their uniqueness through the many books the library offers.